The Fugitive Slave Law was different from other laws of the United States. One unique characteristic was its stance on the philosophy of state’s rights. According to this law, the federal government was responsible for tracking down and returning runaway slaves to their Southern owners, even if the runaways had arrived in a state or territory where slavery was illegal. This federal involvement in a state-decided law was unprecedented. So how did such an odd and wholly uncharacteristic law pass Congress? The Fugitive Slave Law was seen as a compromise between the Northern and Southern states as part of the Compromise of 1850. The Compromise of 1850 allowed California to enter the Union as a free state, while New Mexico and Utah were added as slave territories. The compromise also set the borders for Texas, also a slave state. The slave states were not pleased with this arrangement, since although New Mexico and Utah were allowed to be slave territories, when they applied for statehood most likely they would be entered as free states. Also, by setting the northern border of Texas, the compromise constrained its area, which had magnificent cotton plantations at the time. Ironically, it was the state of Virginia that promoted the Fugitive Slave Law. During the whole era of debate, Virginia firmly believed that a state was protected under the Tenth Amendment to decide independently, without federal interference, if it would become or remain a slave state. However, as Virginia pushed the Fugitive Slave Law, it became obvious that the state's beliefs concerning the Tenth Amendment and federal interference were not consistent. Virginia’s endorsement of federal intervention as part of the Fugitive Slave Law would later discredit its rationale for seceding from the Union. When the state seceded, its justification was because that the federal government was interfering with its rights as a state. Virginia wanted, it seemed, to use the power of the federal government only when it was convenient. Like many pieces of legislation in the era, the Fugitive Slave Law did nothing to protect African American rights. African Americans who had either been born free, had successfully run away, or had bought their freedom were all vulnerable to being captured and returned to slave owners in the south. Since African Americans were not allowed to testify in court, a free African American had no means of explaining the error. This loophole also allowed dishonest slave owners to claim slaves that were not theirs in the first place. However horrible the Fugitive Slave Law was, it did have a few benefits to the abolitionist movement. First, the law brought the horrors and unfairness of slavery to the North. People were, for the first time, seeing slaves. This awakened many sympathizers who had previously been ambivalent. Also, men like Fredrick Douglass and Henry Highland, both runaway slaves and abolitionists, began campaigning for the end of slavery. How do individuals attempt to achieve social justice in a society? Identify the main idea of this cartoon and explain the overall message being conveyed. 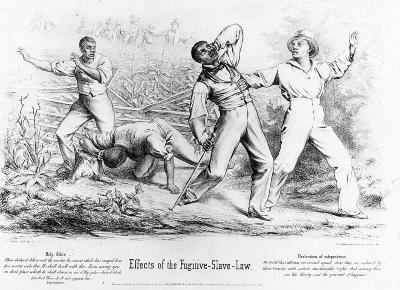 This is a political cartoon titled "Effects of the Fugitive Slave Law". It depicts four escaped slaves being recaptured by armed white men. Below are excerpts from the Bible and the Declaration of Independence that were used to argue against the law. Where do you think this was printed? What would we call it? What section of the newspaper do you think it would be in? Rewrite the U.S. Constitution to indicate who was really included in “We the People." Math: If a runaway slave had a 1-in-15 chance of making it to freedom in Canada, out of 100 slaves about how many would make it? Science: How did the cotton gin work? Did this invention require more or fewer slaves? English Language Arts: Write a persuasive letter concerning the legality of the Fugitive Slave Law in regards to a state’s constitutional rights. Thou shalt not deliver unto the master his servant which has escaped from his master unto thee. He shall dwell with thee. Even among you in that place which he shall choose in one of thy gates where it liketh him best. Thou shalt not oppress him. We hold that all men are created equal, that they are endowed by their Creator with certain unalienable rights, that among these are life, liberty and the pursuit of happiness.